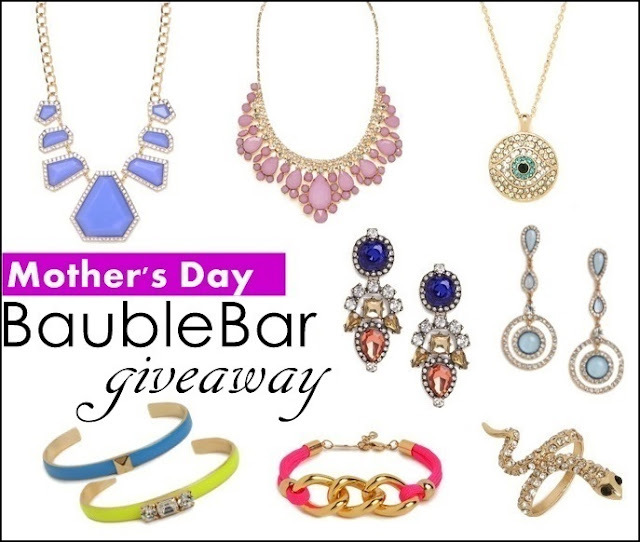 Babblings of a Mommy: Mother's Day Giveaway With BaubleBar!!! Mother's Day Giveaway With BaubleBar!!! Mother’s Day is drawing near, and what better way to say ‘thank you’ to all you fab moms out there - than with a BaubleBar giveaway!!! As an ultimate source for fashion jewelry, Bauble Bar has become one of my favorite online destinations for all things sparkly. With plenty of gorgeous gems and guilt-free prices, there’s no reason you can’t drape your favorite lady in these pretty jewels. Oh this is just in time! I have too many items in my Baublebar shopping cart right now, lol. I'd start with the new pieces from the Honestly WTF collab! I love the Triple Ice Chain! In love with the Ancient Coin Collar!!! I would love to buy the ST. TROPEZ QUARTZ SET. Thanks! I really want the Tropical Gem Bib! I'd love the Pristine Bar Necklace! I would get the The Heartbreaker Bib! It would be perfect for my wedding in July! Love a great necklace, fabulous! I'm loving the Ruby Drop Bib! I love Baubblebar! I want all their necklaces! I love the quality of Baublebar. Would love to win the Tropical Gem Bib. a giveaway with bauble bar? I'm so in. obsessing over the black onyx necklace. The EMERALD SHAN NECKLACE is so beautiful! Awesome site! It took me no time at all to find a whole slew of things I love! One little treasure I found is the silver spike ring set.